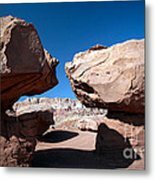 Queen duvet cover (88" x 88") featuring the image "Two Balancing Boulders In The Desert" by Karen Lee Ensley. Our soft microfiber duvet covers are hand sewn and include a hidden zipper for easy washing and assembly. Your selected image is printed on the top surface with a soft white surface underneath. All duvet covers are machine washable with cold water and a mild detergent. 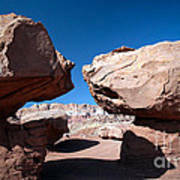 Wonderful, capture of these two boulders against the sky, voted. Beautiful shot, Karen! Like the contrast of the two boulders against the blue sky! Great T VTd. So beautiful image Karen! V.
Thank you very much, Taylan! I appreciate it. Interesting thoughts, Ella, thank you for sharing them! Thank you so much for your enthusiasm, Sharon! I appreciate it. What a super shot of two balancing boulders! What a fabulous find! I love the color of these rocks and they look fabulous against that blue sky. Thank you for your enthusiastic comment, I appreciate it! Gorgeous capture of the awesome views that nature provides us - these two boulders balancing and framing the great view is beautiful. Great composition Love it. Thank you so much! It is an awesome place. Thank you so much Kimberly and Marcus! Such creative minds, it's great! Thanks, Lola! Beautiful image, Karen! Very nice done! vtd. 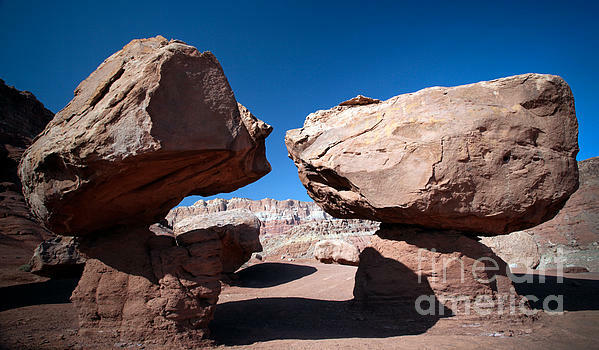 Two enormous boulders balance against a brilliant blue sky as they frame a distant, rugged red and white rock cliff.